Kazuto Ioka will get a home game in his pursuit of boxing immortality. Most of the finer points have been agreed to in efforts to pair the former three-division titlist to face Philippines’ Aston Palicte for the vacant World Boxing Organization (WBO) super flyweight title. Once a deal is fully reached, the bout will take place June 19 in Chiba, Japan. Representatives from both camps declined comment to BoxingScene.com, other than to confirm that a deal has been reached in principle. Ongoing legal discussion regarding international broadcast rights precludes either side from speaking specifically to any remaining details prior to the bout becoming official. The bout will air locally on TBS, which has houses most of Ioka’s bouts throughout his illustrious career. Palicte’s promoter, Roy Jones Jr. Boxing Promotions (RJJBP) enjoys an exclusive arrangement with UFC Fight Pass, which also plans to carry the event. Both boxers will make their second bid at this very title, interestingly with each fighting to separate disputed decisions with Donnie Nietes. Palicte (25-2-1, 21KOs) fought to a draw with his countryman in their vacant title fight last September, with Nietes granted an immediate second crack in which he prevailed over Ioka via disputed split decision last New Year’s Even in Macao, China. Less than a month later, Palicte landed right back in the title mix following a 2nd round knockout of Jose Martinez in their title eliminator this past January. Nietes was ordered to negotiate terms for a rematch immediately thereafter, with the WBO offering just a 14-day window before ordering a purse bid. The shorter-than-normal negotiating period came about amidst concerns that talks would only stall. Such fears were ultimately confirmed on the day of the scheduled purse bid hearing in late February, when Nietes—a four-division titlist—contacted the WBO in writing to inform of his relinquishing the title to instead pursue more lucrative fights in the twilight of his career. The move was expected by Palicte, who sought out the next-highest rated challenger. Ioka (23-2, 13KOs)—who turned 30 this past March—was more than willing to answer the challenge, as the two camps continue to firm up details for their forthcoming bout. The former three-division titlist made history in his first reign, outpointing Akira Yaegashi in their thrilling June ‘12 12-round strawweight war which marked the first-ever unification bout between two defending titlist from Japan. Title reigns at junior flyweight and flyweight were less inspiring, but he’s found new life at super flyweight following a dominant win over McWilliams Arroyo last September—on the same card as Nietes-Palicte—and a narrow and debatable loss to Nietes last December. Ioka is presently just one of four boxers ever from Japan to win titles in three weight divisions. He is currently in the company of Koki Kameda (108, 112, 118), legendary Hozumi Hasegawa (118, 126 and then 122) and Kosei Tanaka, who currently reigns as a flyweight titlist after having held belts at strawweight and junior flyweight. Naoya Inoue is technically also among that lot, having won titles at 108- and 115-pounds while presently in possession of a secondary bantamweight title. The unbeaten pound-for-pound entrant will seek an upgrade as he faces unbeaten IBF titlist Emmanuel Rodriguez on May 18 in the semifinals of the World Boxing Super Series bantamweight tournament. 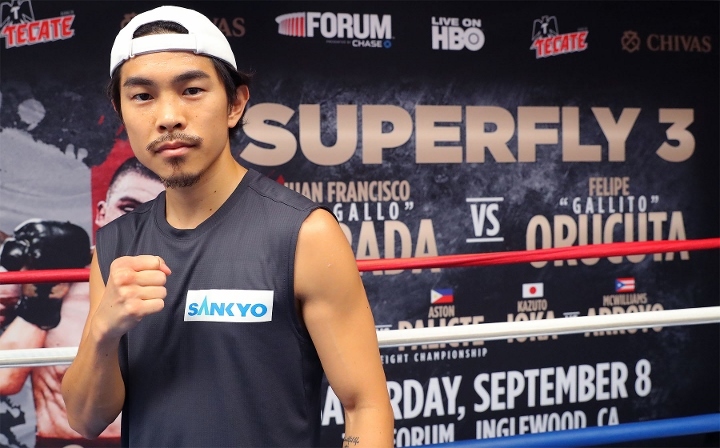 One month later, Ioka will have a chance to leave the growing pack for a place all his own as Japan’s first-ever four-division titlist—with his shot at history coming 45 minutes away from his adopted Tokyo hometown. Bermane Stiverne on the secret weapon Deontay Wilder uses to secure knockouts!